Managing your horse’s weight effectively is essential all year round but as we head into the warmer seasons and the grass starts to flourish, it is even more important to ensure your horse doesn’t pile on the pounds. World Horse Welfare Head of UK Support, Sam Chubbock has this essential guide. Assessing and monitoring your horse’s weight is a vital part of any weight management plan and the best way to find out if your horse is carrying the right amount of body fat is to learn how to fat score (also known as body condition scoring). There are two main fat scoring systems – the 1-5 system (Carroll and Huntingdon) or the 1-9 system (Henneke). 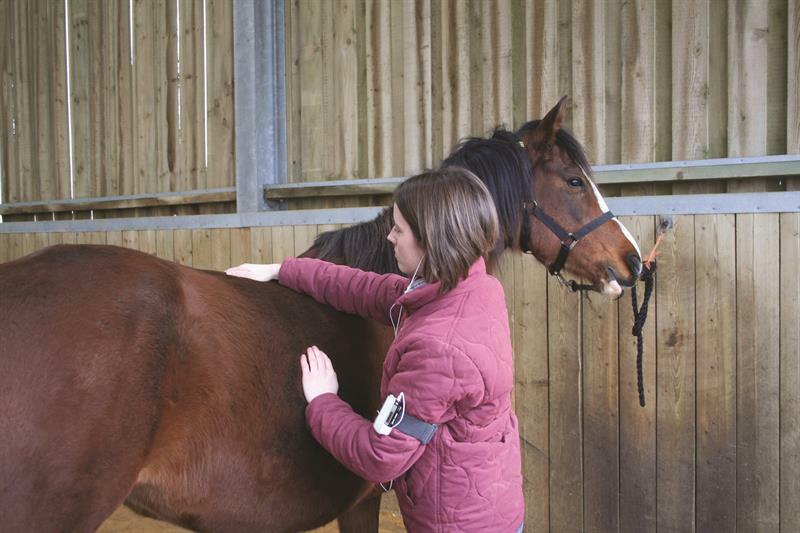 Either system provides an effect way of assessing condition, with the key being to get hands-on and feel for fat cover rather than just looking at your horse. A weightape provides a good tool for monitoring weight and identifying changes but remember this does not reflect condition. The most accurate weightapes have both a horse and pony side so you can choose the correct one according to your horse’s height. A combination of fat scoring and use of a weightape is ideal for ongoing weight management. If you have access to a weighbridge this is also a good tool for monitoring changes in weight and will provide an accurate measurement. If you are feeding forage, then this should always be weighed using a hanging scale. Soaking hay for several hours will reduce its calorie content– get advice from a nutritionist about the best way to approach this for maximum effect. You can dilute hay by mixing it with good quality oat or barley straw to provide bulk without the calories but do take advice before trialing this as it is not suitable for all horses, particularly those with poor dentition. If you do provide hard feed, consider whether you really need to and whether it is appropriate for his workload. If your yard has a feeding routine or if you would like to reward your horse after work then a good alternative can be to feed a low calorie vitamin and mineral supplement which are available in ‘treat’ form. You can put a few of these ‘treats’ in a bucket so your horse won’t feel he is missing out, without adding extra unwanted calories to his diet. You may choose to feed a balancer or supplement so if you need a carrier to add these to, make sure you find one which is low calorie. Any feed needs to be accurately weighed and measured. If you don’t have access to weighing scales at your yard, you could weigh out the feed at home once and mark the correct amount on a cup or scoop for ongoing use. Using small holed haynets will help make forage last longer and you can even put one haynet inside another to make it even more of a challenge for your horse to eat! To help relieve boredom on a limited ration you can also divide it between two or three nets or piles spread around the field or stable. Limiting the time your horse spends in the field is not always the best way to help them lose weight as in some cases horses with limited grazing time eat at a faster rate and therefore consume more than they would if they stayed out for the full day. A better option can be to reduce the amount of grass the horse has access to by area rather than by time. If you have the facilities, a track system is a great way to reduce grazing and get your horse moving around more. These can range from one single track round the outside of the field (the centre can be a good place for horses who may need a little more grazing) or a more complicated maze if you are feeling creative! Place the water trough at one end of the track and the gate at the other, plus you can leave piles of low-calorie forage (if needed) at different points around the track which will keep the horse moving in order to find his food and drink. If you are unable to install a track system, strip grazing can be effective at limiting the amount of grass available (although don’t be tempted to move the fencing too much) as is letting another horse graze the paddock first so your dieter is not going straight on to lush grass. Another option is to graze more horses on one paddock taking it above a traditional stocking level or adding other grazing animals, but make sure you’re on top of pasture management. At our Rescue and Rehoming Centres we have also found that putting a particularly good doer with a more active companion is another effective way of keeping the horse moving! At livery, you might not always be free to modify the fields so a grazing muzzle can be a helpful tool in reducing your horse’s grass intake. Choose one which reduces grazing, not stops it, but remember these do not work on really short grass. If you do need to use a grazing muzzle you can find helpful guidance on the National Equine Welfare Council (NEWC) website. One other option is to provide turnout without grass, this can be using an all-weather arena or if available a bark or sand paddock so your horse can go out without taking on additional calories. It is important to provide forage if using any of these options. Exercise is undoubtedly one of the most important factors in any weight loss plan but this doesn’t have to mean ridden work. If your horse cannot be ridden or the time taken to prepare to ride is too long on a tight schedule, walking in hand can be a great way to get them active and raise their heart rate. It is important to stress here that walking needs to be power walking and prolonged activity is the best way to help burn calories, but everyone has busy lives so any exercise will always be better than none at all. Horse agility can be a fun way to exercise your horse from the ground which not only helps develop your bond but can also play a part in desensitizing. Equine weight management is no easy task but it is vital to safeguard your horse’s health and quality of life. There is plenty of advice and support available to help you, visit www.worldhorsewelfare.org/right-weight for more information or call our advice line on 01953 497238.